I'm intrigued with the newly-announced Ironman Lake Tahoe. It has a lot going for it: For starters, Tahoe is beautiful. The water temperature is expected to be a not-unpleasant 65-70 degrees. Tahoe is at that awkward distance which is too far to drive and too close to fly, but it's a fairly easy trip from Los Angeles. Sounds like a great place for a race, except for one tiny detail: it has no oxygen. Ironman Lake Tahoe starts over twice as high as any other race I could find. If you can find a higher race, please let me know. I think there are going to be a lot of surprised (and tired) people come race day. All in all, this sounds like an absolutely wonderful race... to spectate. See you there. Stupid Dutch: "How much money have you spent on triathlon over the years? With gear, flights, hotels and everything... 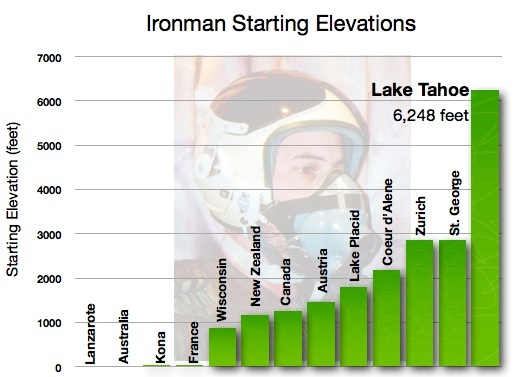 The two Ironmans alone must have been a couple thousand each." Me: "Actually, I've done three Ironmans." Stupid Dutch: (pause) "It doesn't look it."